"This is the first time in months that we've seen a correction that looks like it may develop some meat to it." 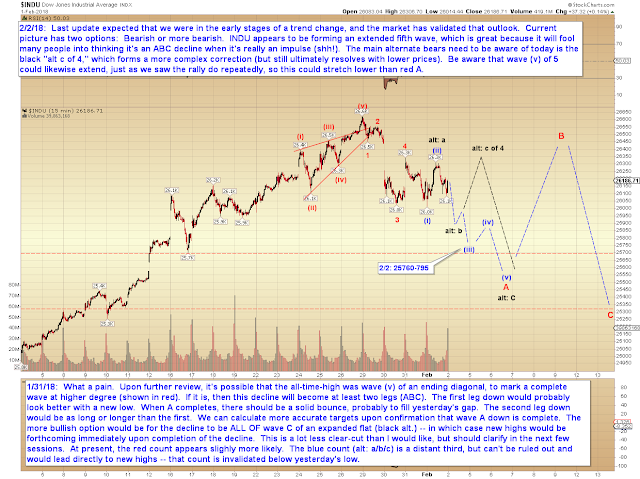 And since then, INDU and SPX both made new lows, thereby confirming their declines are impulsive (five waves). 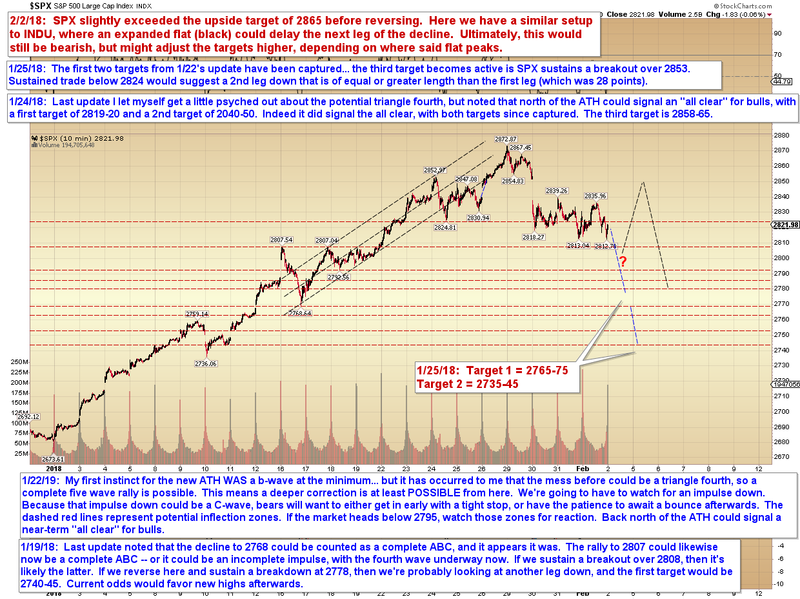 Barring the unusual expanded flat discussed last update (still the alternate count), this suggests at least one more leg down is pending, possibly after a bounce (see charts). In conclusion, bulls need be in no rush to buy this dip, because it's clearly still unfolding. And since it could develop into something much more serious, we should now shift our footing from not front-running bearishly to not front-running bullishly. In other words, for the past few months I've warned bears not to short the market -- now it's come full circle in just a few sessions to where bulls will want to be cautious before jumping back in. 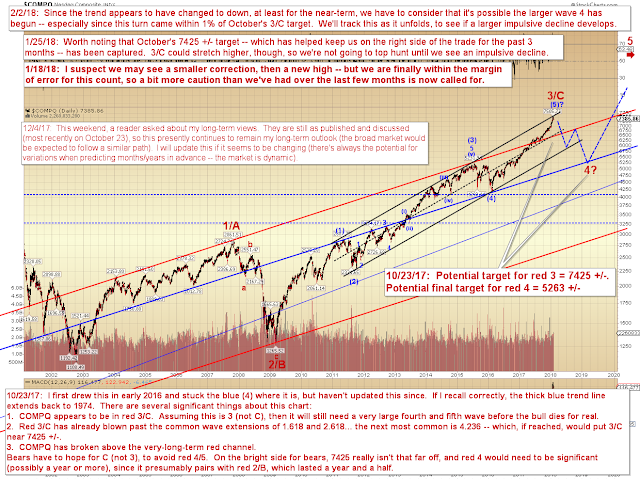 As I wrote in our forums, the equities market is correct to react to the bond yield spike. This is, after all, coming on the heels of the world's central banks pumping record levels of liquidity into the market, and artificially holding down interest rates for decades. If bonds react too much, then the bond bubble will pop -- and the mortgage market will be impacted. If the mortgage market is impacted too much, then the housing bubble will pop. And if the housing bubble pops... then it's 2007 all over again. And the equities bubble will pop explosively. I have long suspected that the next meltdown would see multiple asset classes collapse at once, because they are all interlinked. I have also long suggested that the central banks might recover from the first time this starts to falter, which could create our potential fourth wave, and lead to the fifth wave (when they recover control). 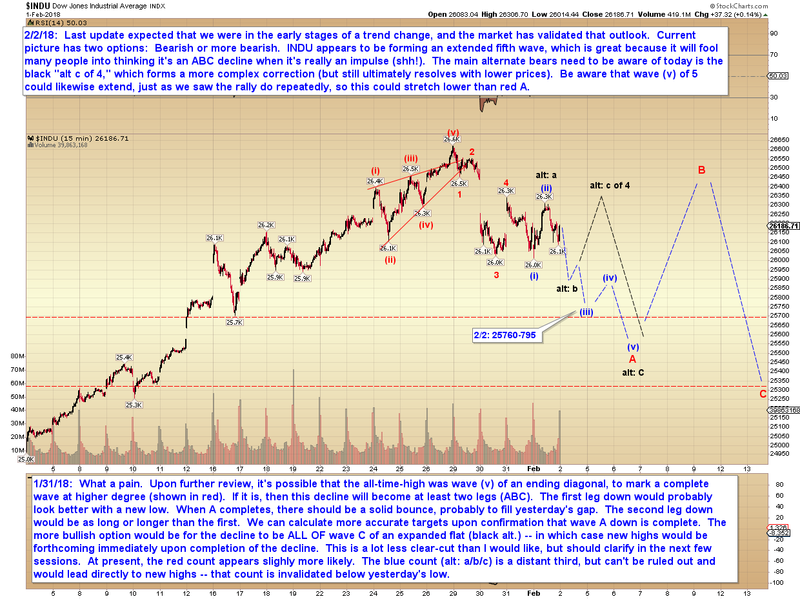 Of course, we do have enough waves for a complete fractal, so a fifth wave is not guaranteed. That said, we're way ahead of the game here, and perhaps this will simply be a minor correction. The point is, perhaps it won't. 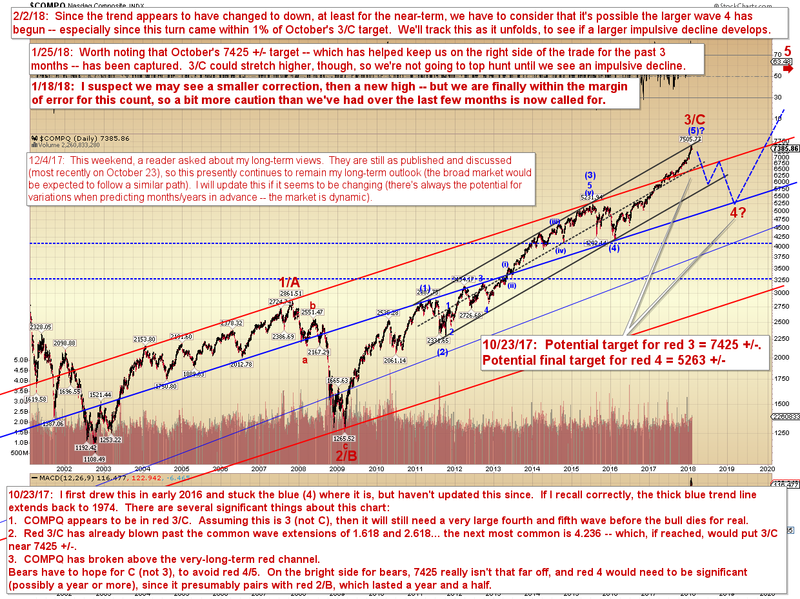 Since this turn lower has come after an extended fifth wave rally, there is potential for significant downside. 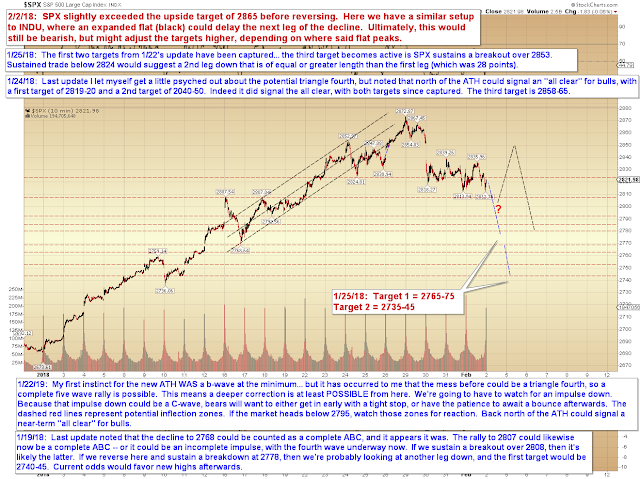 Thus we would be wise not to simply assume it will be a minor correction, but to instead see how this pans out (to see if the fractal develops into a larger five wave decline, or remains a simple ABC) -- and to thus remain patient before "buying the dip." Trade safe.